Nicknames: Monoxide Child, Monoxide, Hektik, Paul Monoxide, Paul, Little Poot, etc. 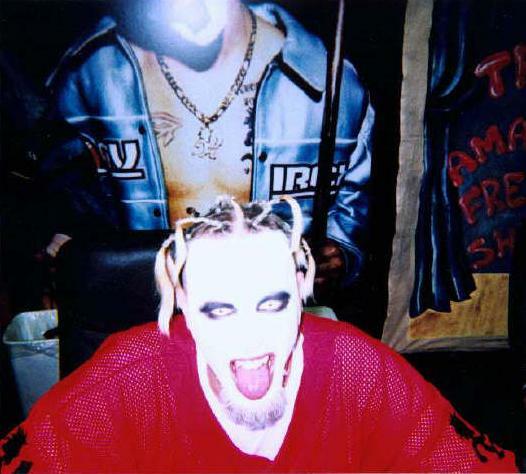 More Info: Monoxide is considered a schizophrenic paranoidal compulsive chain addicted smoker. He suffers from a dependency and addiction to nicotine based products. Although he enjoys the Newport brand Monoxide has been known to smoke any tobacco product and when last evaluated he was smoking an average one and a half packs an hour. thanks to http://groups.msn.com/tWiZtIdaNdIcP/abouttwiztid.msnw & http://www.hallsofillusions.com/mainsite/twiztid for the info above.